With the Doctor wanting to repair the TARDIS in peace and quiet, Barbara, Ian and Susan decide to get some experience of living in the nearby village of Salem. But the Doctor knows about the horrors destined to engulf the village and determines that they should leave. His friends are not impressed. His granddaughter Susan has her own ideas, and is desperate to return, whatever the cost. But perhaps the Doctor was right. Perhaps Susan's actions will lead them all into terrible danger and cause the tragedy that is already unfolding to escalate out of control. 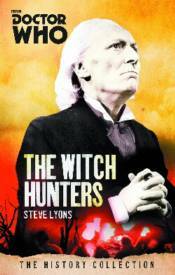 This is an adventure set in the 17th century Salem Witch Trials, featuring the First Doctor as played by William Hartnell and his companions Susan, Ian, and Barbara.